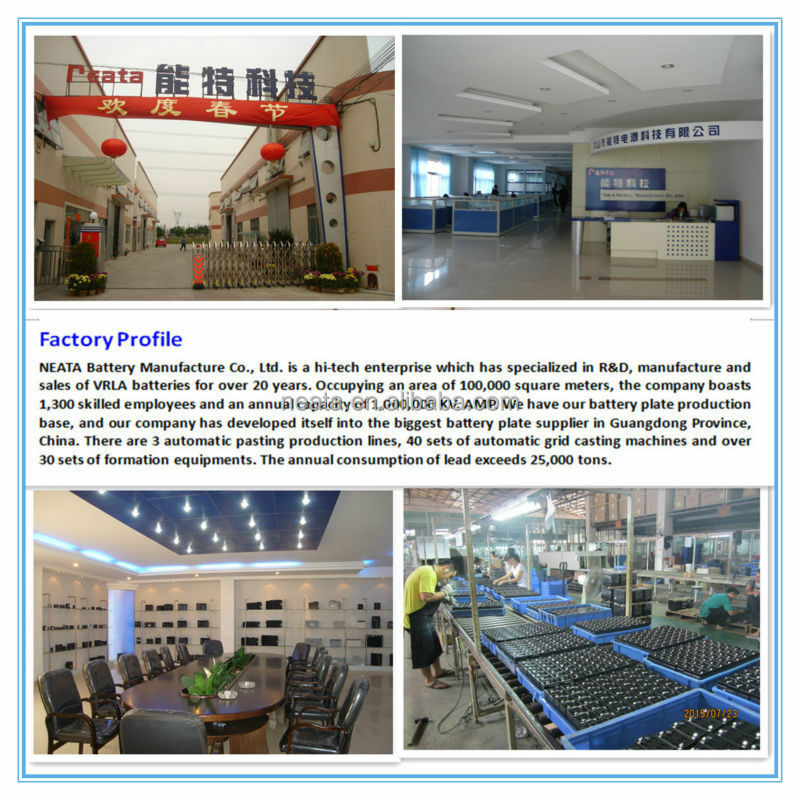 Neata Battery manufacture Co., Ltd. Is a professional VRLA BATTERY include 6V&12V produces, located in Zhongshang and have office in Guangzhou and Shenzhen, can offer very convenient transportation access. 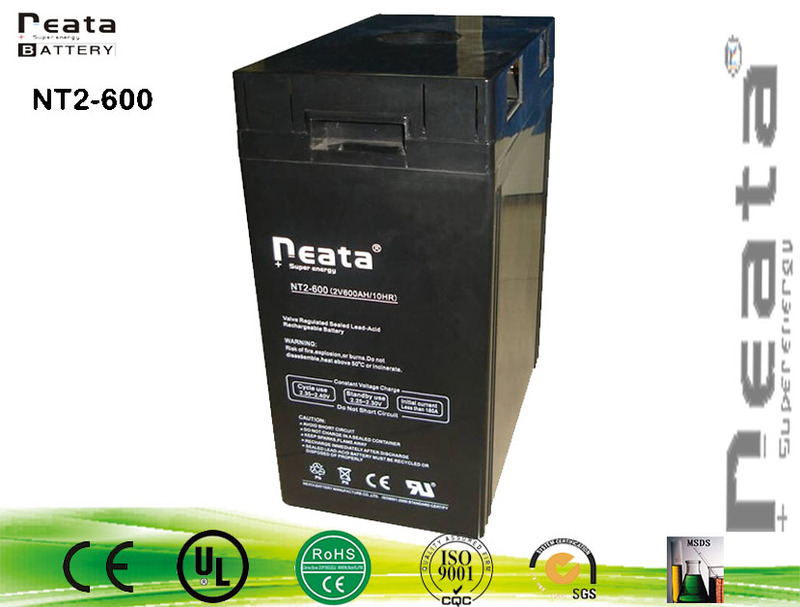 Neata Develop corresponding product series, such as UPS battery, solar deep cycle battery, gel battery according to customer's different applications. We can OEM customer's LOGO according to customer's authorization. 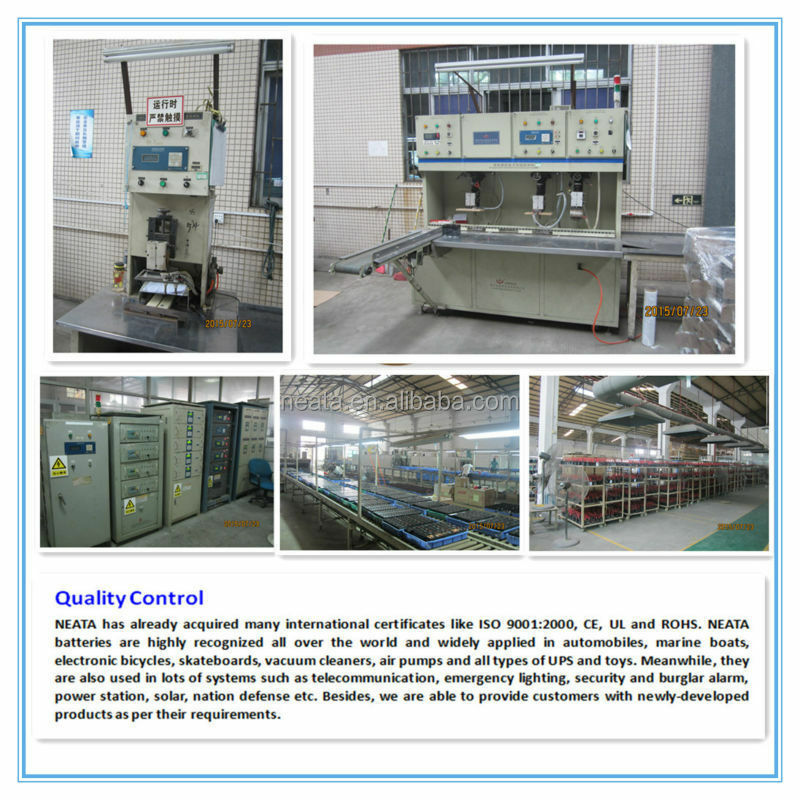 Neata enjoys high reputation by set up a complete system with a group of experienced technology engineers, strong R&D sources, integrate QC system and production management system, we do control the product quality and production efficiency very well. 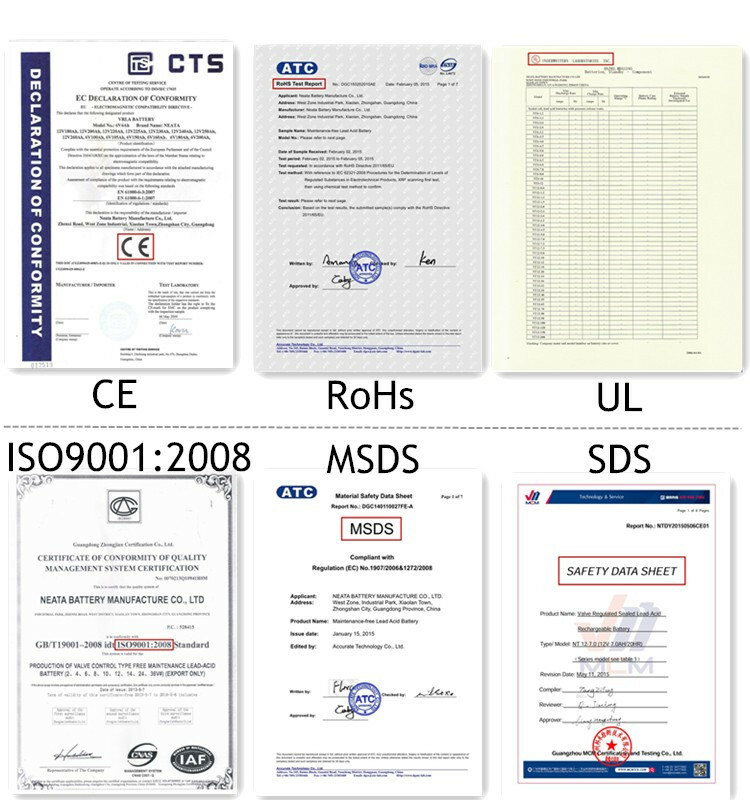 We possess the following certificate CE, UL, ISO9001, ROHS Certification. We mark code on each battery; so as long as you have any questions, we can check product production information. Customize a NEATA special identity card number for each product. We have an excellent team with over 10 years experiences on VRAL BATTERY and more than 200 skilled workers. Each salesman has been trained about professional product knowledge to provide thoughtful and careful follow-up service for each customer order. 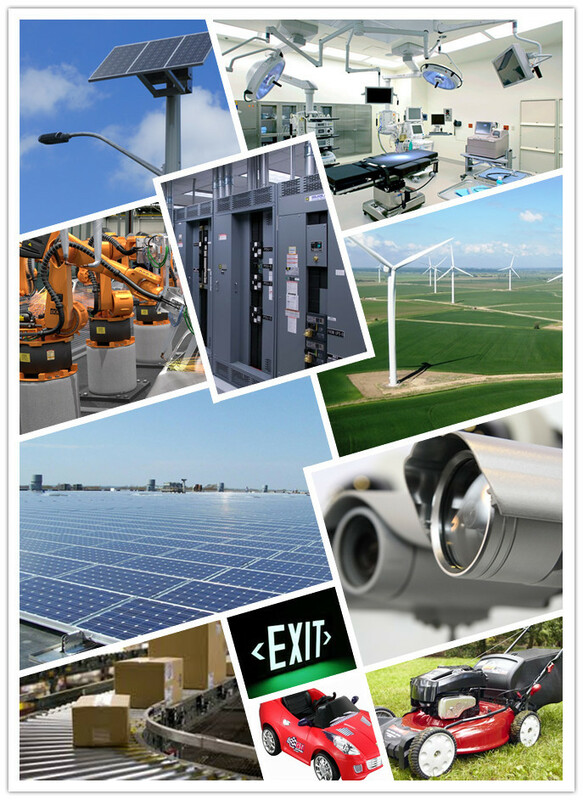 We dedicated to provide economy and environment friendly battery products and create a new widespread field for storage battery products with our customers by joint efforts. Q1. What kinds of battery will you provide? A1: 1. 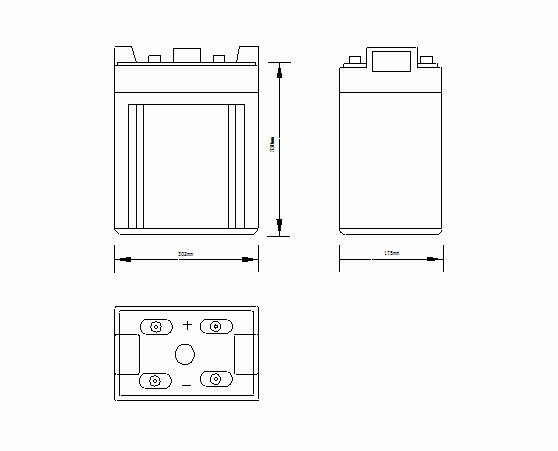 We can provide full range of valve regulated lead acid batteries, such as Standard series, Deep Cycle series, Gel series, Front Terminal series and High Rate series. Q2. Where can we use the batteries? A2: Our batteries can be widely used in UPS and computer standby power supply, Solar and wind system, Control system, Telecommunication system, Emergency light system, Alarm system, Security system, Firefighting equipment standby power supply, Railway system, Ship equipment, Aeronautical facility, Electric toys, Power tools, Emergency lamp, Medical treatment equipment, Power system, Power station, Standby power supply, Military equipment, Telephone switching system. Q3. 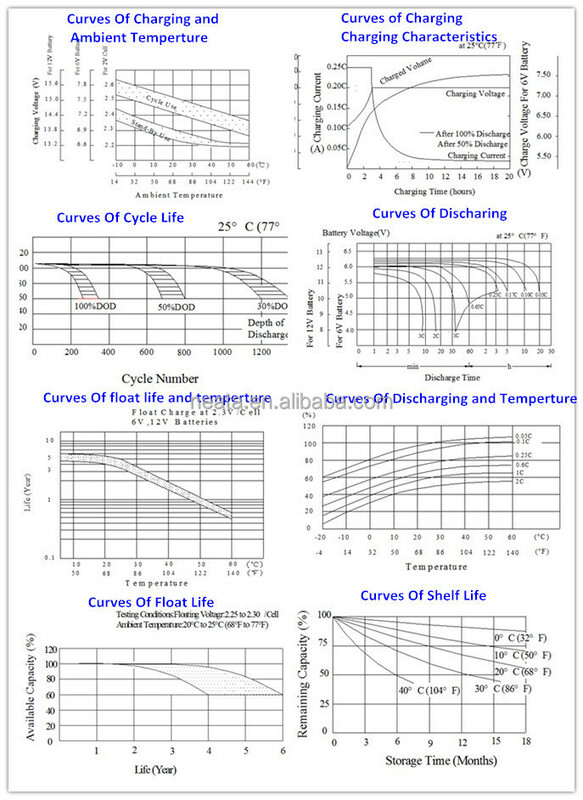 Can your battery meet CE and UL requirements? A3: Yes, our battery not only can meet CE and UL, but also ISO9001,ROHS Certification. Q5: Is there cheap shipping cost to import to our country? A5: For small order, express will be best. And for bulk order, sea ship way is best but take much time. Q6: Can we change the color of the battery? A6: Yes, the color can be customer-made according to your requirement. Q7: Can we get support if we have our own market position? A7: Please inform us your detailed mind on your market demand, we will discuss and propose helpful suggestion for you, to find the best solution for you. Q9. What is the service temperature? Q10. What is your battery life cycle? Life cycle is connecting with discharge depth of discharge (DOD). Q11: Which payment term can choose? Q12. 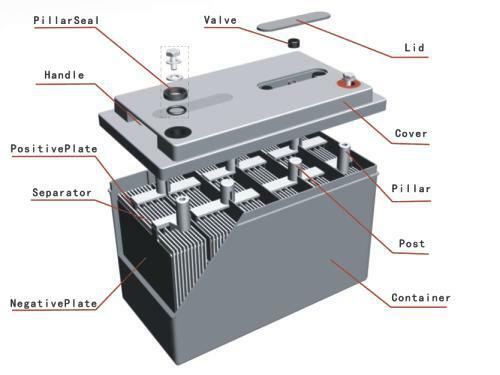 What are the advantages and disadvantages of lead-acid battery? A12.Advantages: low price, the price of lead acid batteries is just 1/4~1/6 of that other types of batteries, with a lower investment which most users could bear. Disadvantages: heavy and bulk, low specific energy, strict on charging and discharging. Q13. Are lead-acid batteries recyclable? A13.Lead acid batteries are 100% recyclable. Lead is the most recycled metal in the world today. The plastic containers and covers of old batteries are neutralized, reground and used to the manufacture of new battery cases. The electrolyte can be processed for recycled waste water uses. 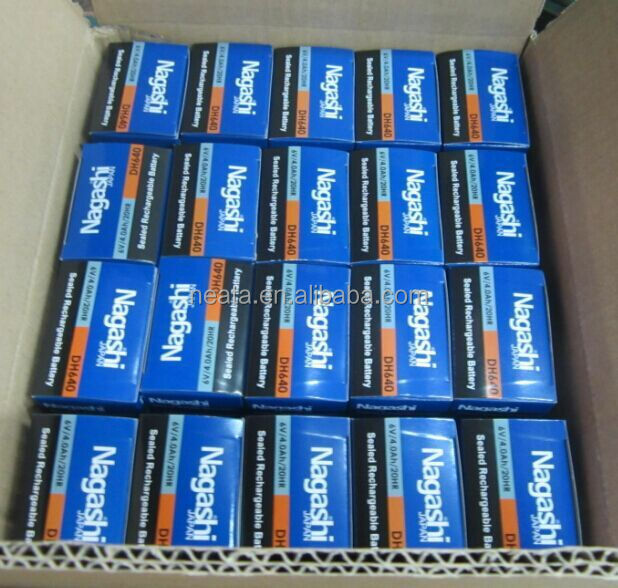 In some cases, the electrolyte is cleaned and reprocessed and sold as battery grade electrolyte. In other instances, the sulfate content is removed as Ammonia Sulfate and used in fertilizers. The separators are often used as a fuel source for the recycling process. Welcome to wholesale the factory price ce msds rohs ul certificated solar battery long life maintenance free 2v 600ah dry agm deep cycle with our professional battery manufacturers and suppliers in China. And the customized service is also offered in our factory. 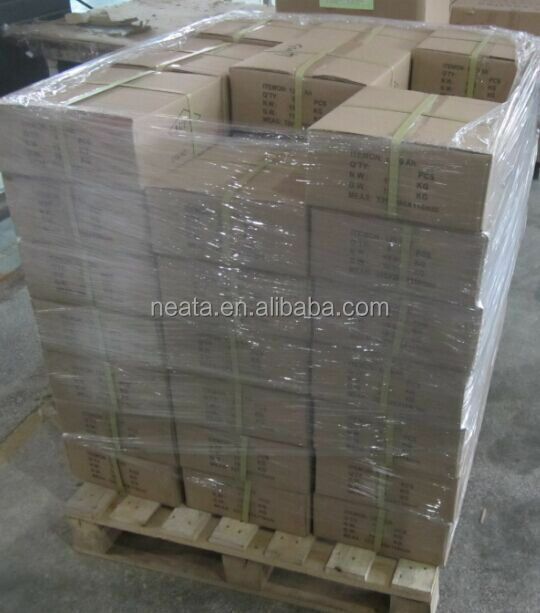 Please be free to check the quotation of the battery made in China.